How the Lyre Came Down from Heaven Just in Time! Yet far away from this booming world, the unassuming, humble lyre tone – as though sent by a merciful heaven, and that at Michaelmas time – was making its voice heard for the first time. The lyre was created in one night. And like out of the night, when the sound ether is allowed to work in silence, this unheard of instrument has the unique bonus of being brought forth out of stillness, out of night. It was clad with wood connected to the planet Mercury, from the elm tree, (I assume it was the red elm. –CAL) making the top and bottom soundboard, and the cherry wood connected to the Moon served for making the framing. Both pieces were left over bits from wood used for mighty pillars. Mercury relates to movement, the moon to constant change. Is this not reminding one of music therapy? Not long before – three and a quarter years – those 26 pillars had still been carrying the double cupolas of the first Goetheanum that burned down, by arsen, in the New Year’s night 1922-23. From that time on, volunteer watchmen were asked to guard the grounds around the site. Among the watchmen were a musician, Edmund Pracht, and the sculptor and woodworker, Lothar Gärtner. They met and shared from their different vantage points about what moved in their souls. Neither of the two young men knew that already in 1912 Rudolf Steiner had spoken about a kind of lyra that would be more suitable for Tone Eurythmy than the piano. Tatiana Kisseleff tells in her Memories of Rudolf Steiner about this, and that Rudolf Steiner himself wanted to help build such a lyra. As Julius Knierim remarks (Hollander/Rebbe, Die Leier, Verlag am Goetheanum, 1996), World War One came, and this impulse was never taken up. He looked at what he had just drawn on the blackboard and said: Is that not like an archetypal music instrument what I have drawn here! was willing to build such an instrument. He must have shared this with Lothar Gärtner who then sat down on September 24 to make a design of an instrument, but it was all round, very large and mighty, and he wanted to carve this later. Then Edmund and Lothar had what is described as a “classical” conversation about the cornered or round form of such an instrument (wish I had been there!). The initiatives just described were, however, more provisional, yet Gärtner says, they both were fulfilled later in the month – Pracht’s design built by the violin builder and Gärtner’s mighty design beautifully carved. The actual story of the creation of the first “Leier” begins here, as I heard it from Gärtner and Pracht directly. W. Lothar Gärtner, full of initiative, brought along Edmund Pracht’s design and, having altered it a little, went with it to the big joinery shop in which, almost three years before, the Christmas Foundation Meeting had taken place! He found two pieces of thin elm wood for the sound boards, some pieces of cherry wood for making the frame, and a short piece of an iron rod from a bundle that would serve as armature used in the concrete for the new Goetheanum building. And he worked all night. At the crack of dawn he asked his friend Edmund for the pegs and the strings from an old zither he had used for sound experiments. By 9:00 a.m. when Edmund returned from his watch, Lothar could hand over to him the instrument. “Sie tőnt!” was the cry of joy echoing in that history-laden joinery shop. With that exclamation – “it sounds!” – they hurried to four older friends, Elena Zuccoli, Käthe Mitcher, Max Gűmbel-Seiling and Tatiana Kisseleff, who had surely been confirmed about what Rudolf Steiner hinted to her in 1912. 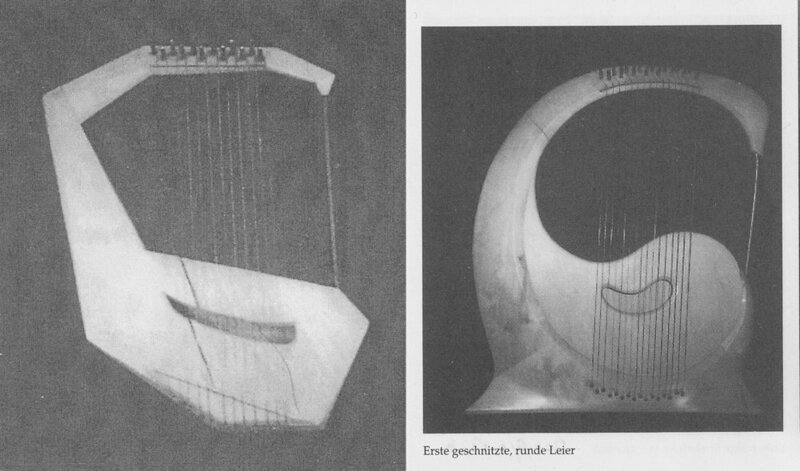 Then in the afternoon Edmund showed it to Ita Wegman who had known of their plans and supported their endeavor, and later also to Elisabeth Vreede, who became the other godmother of the lyre. Yes, now it was right to speak out the name, not just coined from the Greek Lyre. Yes, all this was on October 6, a Wednesday – I looked it up – which we now celebrate 90 years on. Many thousands of lyres, it is true, have since been built in round and cornered shapes; uncountable versions have been developed, and still they belong to the original lyre impulse. A whole wealth of new instruments has arisen in the wake of the humble kinderlyre, built on October 6, 1926, with just twelve strings.